Next Term one of my colleagues at school goes on long service leave. A parent of one of the students tells me that he will be heading over to Canada for a well deserved holiday. I got into the kitchen to bake some cookies for the class to share in celebration of his leave – and to wish him well on his trip away…of course they had to be Canadian. 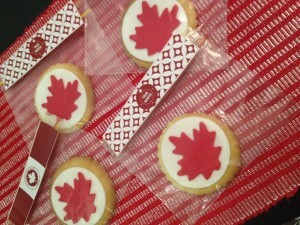 So in my research – not that I did much, I did find out that Canada Day is celebrated on July 1st. 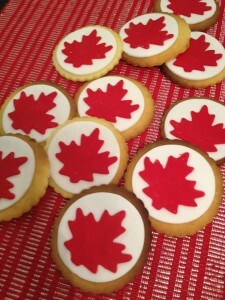 What a great time for me to share with you these simple Canadian themed cookies and to wish all the Australian-Canadians a Happy Canada Day for this Tuesday. Ever so simple and obviously Canadian. I thing that bags make them more presentable and easier to deliver hygienically to kids in a classroom. They have been packaged into snack sized zip-lock bags and to continue the theme I printed out themed banners which you can find here and I stapled them each bag. Happy Canada Day everyone…and happy baking.